My first post after a long time. I have been traveling for 2 months and didn’t have time to write anything. 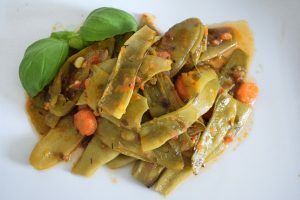 Do you know why I decided to post this recipe first? Because it brings back very sweet memories from our holiday in Crete this winter. I ate this bean in a very small restaurant in the middle of a food market, a place where I usually wouldn’t eat because it didn’t look very welcoming. We didn’t have a choice because it was 1st of January and most of the restaurants were closed at that time. So, we decided to give it ago and I am still happy with that decision. Everything we tried was super delicious. 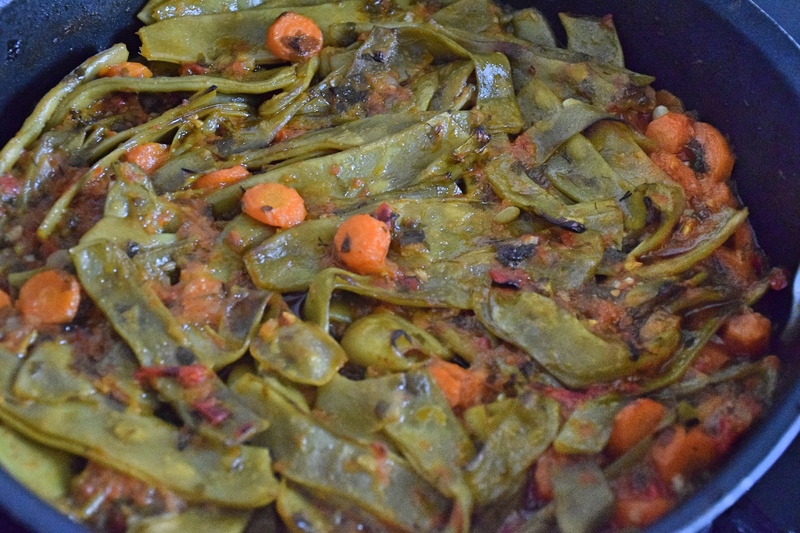 I took the recipe for this runner bean from the cook as I was sure that I will make it someday at home. Last week when I saw the runner bean at my local shop it just said to me ‘take me home’. When I was cooking it I just can not describe how I felt. This is a very simple, easy and unpretentious recipe but I guarantee for the taste. We are going Crete again in 2 weeks time and I will definitely go back to that place. Cur off the two ends on the beans and remove the threads along the sides if there are any and add into a roasting tray. Add all of the vegetables to the bean together with some salt & pepper, dill and the olive oil and cover with a foil. Put into an oven on 200 C for 1 hour and then take off the foil and bake for 30 minutes. 1. Махаме крайчетата на боба и го слагаме в тава за печене. След това слагаме всички други зеленчуци, копъра, сол, черен пипер и зехтина. Покриваме с фолио и славаме във фурна на 200 градуса за 1 час. После махаме фолиото и допичаме за още 30 минути. Hey there, I just want to say thank you for the post. I shared it on my Facebook page and got an excellent reaction. Keep up the great work.